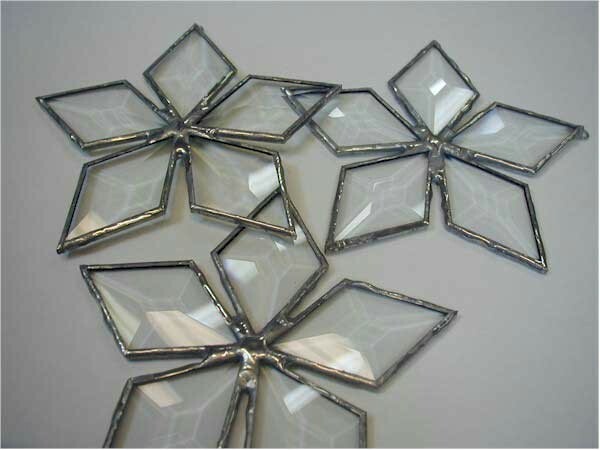 Sometimes we find that the metal surrounding a piece of glass begins to corrode. It is quite easy to remedy the problem. 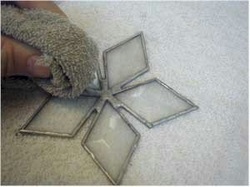 Some artists in the stained glass industry refer to this white powder as "mold", but I believe they are mistaken. Mold doesn't grow as fast as I've seen some oxidation take place. 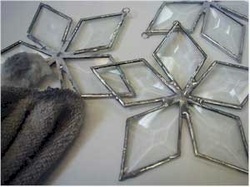 Here are some beveled stars that have developed a white powdery coating of oxidation. 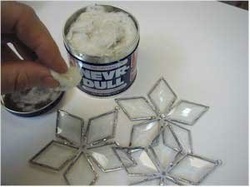 Take a small piece of the cotton that comes in a can of "Never Dull" (or other silver polish available at hardware and craft stores and on-line). Rub the lead lines and get them well coated with the chemical on the cotton. You'll see that the glass gets a little cloudy from the coating. Take an old rag and polish the lead lines very vigorously. This is where elbow grease really pays off. 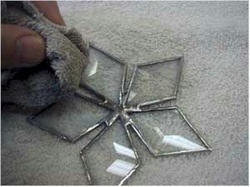 Here the polishing has begun and you can see that the glass gets a high luster as well. 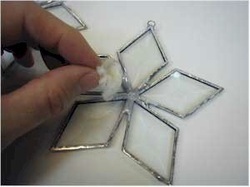 The first star is complete, you can see the difference, the corrosion is gone from the top star and still needs to be polished from the other two. 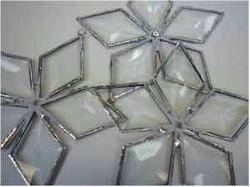 This technique works well with larger stained glass pieces. Here all three are complete, Oxidation can be removed and prevented by other methods not covered here. Check out the rest of this Bringing New Life To Windows section.